This is how I feel about exams and studying. Back with Hitsugaya and Matsumoto, Bazz-B has destroyed all of the ice, and is slowly walking towards the Soul Reapers whilst engulfed in his flames. It seems that Hitsugaya has a bad aim, and only pierced Bazz-B’s overcoat. Seemingly more concerned about the state of his uniform than the battle, he then proceeds to remove his coat and prepares to fight. As Sui-Féng walks away from BG9, a wire flies at her, and she only just manages to dodge in time. As suspected, BG9 is not a living being, but some sort of robot made up of the deadly wires. 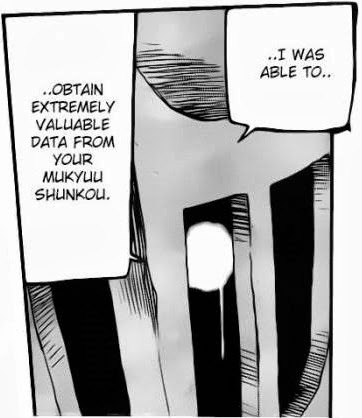 He then reveals a whole host of weapons on his body, and states that he expected more from Sui-Féng’s Shunkou technique, and that he will not even need to use her stolen Bankai. Come with me if you want to... err, maybe not. As he fires off a number of missiles, Sui-Féng manages to avoid them all whilst taunting him. However, one of his wires manages to pierce her wrist, pinning her in place and making it impossible for her to attack. After repeating the fact that he was able to gain a lot of information on Sui-Féng’s technique, there’s a huge explosion. Meanwhile, Bazz-B explains to Hitsugaya that his flames are anything but weak, and that every Quincy who was burned by Yamamoto’s flames during their last invasion are all perfectly fine. This turns out to be because Bazz-B’s flames are so powerful that they could offset the ones used by Yamamoto. By way of a demonstration, he destroys a huge pillar simply by placing his hand upon it. "Oh no. He's still alive. What a surprise. I did not see this coming." After stating that one finger would have been enough to defeat Hitsugaya’s Bankai, he effortlessly melts an attack from the Captain. Sensing that things are about to go South, Hitsugaya orders the retreat, and tries to cover Matsumoto and the rest by creating a lattice-like ice wall. Perhaps predictably, Bazz-B manages to tear through the barrier with a ray of heat expelled from his index finger, and stabs Hitsugaya in the chest. 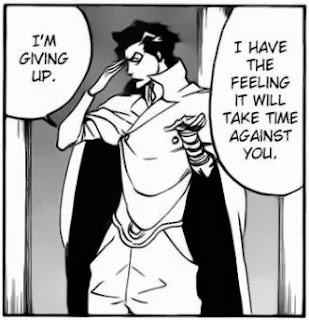 The revelation that Yhwach considers the Captains a threat was a surprise, considering how thoroughly they were beaten last time. Granted, they have some new techniques, but so far I can’t see how any of them will defeat their opponents without some major outside intervention. Hopefully said intervention will arrive in the form of Byakuya, Ukitake and Komamura. Or maybe even Kenpachi, and we’ll finally get to see his Bankai. Wait, are you crying? Can you even cry? Whilst it’s still not been stated whether or not the Quincies have activated their Vollständig forms, I’m fairly certain that’s what just happened. Granted, neither of the two shown so far have had such a drastic change in appearance as Opie had, but the fact that their appearance has changed slightly, coupled with their sudden ability to defeat the Captains kind of implies that they’ve activated their equivalent of Bankai. I was a bit confused when Bazz-B said that everyone who was burned by Yamamoto survived. Primarily because Driscoll Berci (the guy who killed Sasakibe and stole his Bankai) was incinerated by Yamamoto, and he’s never shown up again. Unless Bazz-B just forgot about him. The other thing was how they survived. How did Bazz-B’s flames save the other Quincies who rushed Yamamoto? Did his flames somehow counteract those used by the Captain-Commander? Or are all Quincies just too strong to be affected by his flames? Either way, it was a bit confusing due to the fact that it wasn’t explained very well. Remember this guy? Nope, me neither. To be honest, the fact that Hitsugaya got stabbed was a bit of a shock. I had expected the fight to go on for a while longer before someone was injured, but the fact that the Quincies obviously aren’t messing around is a welcome subversion of my expectations. I still don’t think he’ll die though. Yes, he appears to have been stabbed through the heart, but this is manga – characters survive injuries that would instantly kill normal humans. Lastly, there’s been a bit of debate over whether or not Hitsugaya’s Vacuum Ice Wall technique is actually possible. In order to clear things up a bit, allow me to explain. Firstly, Bazz-B’s power relies on oxygen in the air, which allows his fire to burn. No oxygen = no fire. To start, Matsumoto used her ash to create the foundation of the ice walls, and Hitsugaya then froze the ash in place. Then, Matsumoto used more ash to expel air from the spaces between the walls, creating a makeshift vacuum. This was done in between every sheet of ice, creating a large number of thin ice walls with no oxygen (or indeed, anything) between them. When Bazz-B melts the first sheet, the fire moves into the vacuum between the melted sheet of ice and the next one. 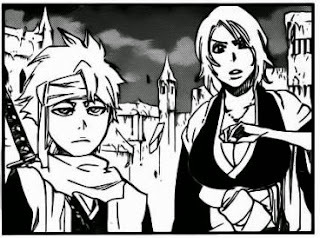 Due to the lack of oxygen in the space between walls, the fire is extinguished, and the rest of the ice sheets remain unmelted, and so Hitsugaya and Matsumoto were protected. 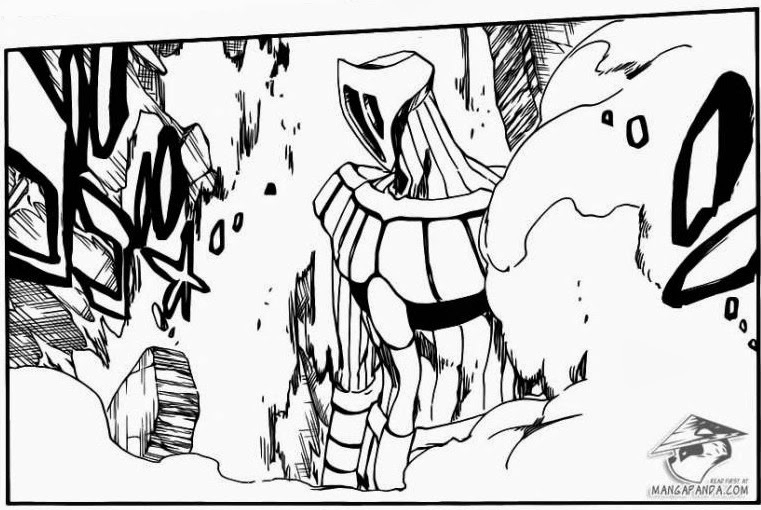 Good Things: Another funny Kurotsuchi moment. The Quincies are starting to get serious. Bad Things: Possibility of Hitsugaya dying. Bazz-B didn’t properly explain how he survived attacking Yamamoto. ClayDragon is currently studying Physics at university, and is constantly bewildered by it. The main method of contacting him is his Gmail account at kyleroulston1993@gmail.com. The alternative is his Skype account at kyleroulston1993. When not playing games or reading, he can be found with his head in his hands whilst trying in vain to understand quantum physics. His collection of geeky shirts is unrivalled. Okay, that's how the vacuum thing works, I'll take your word for it. I'm not the best at science. But did you really think Hitsugaya being stabbed will have any effect? It's probably just another "ice clone"(this is now Naruto)., ice mirrors or the like. Kubo has a very long track record of pulling things like this. If you re-read Bleach(give chapters 1-52 a read), you'll notice a lot of severed limbs( Star wars?) and how it has no long lasting effect on the popular characters. The popular characters are always treated nicely in Bleach. The not-so popular Yamamoto was killed off and now we find out he died for no reason, 3rd Hokage esque. In comparison, Byakuya had a "death" scene only to be healed and back for more fans. Actually, killing Hitsugaya is a good thing. It means Kubo is being bolder. You see, if a character is more popular, his/her death will have more impact. On a more positive note, Bleach seems to be improving. There were more panels per page, allowing the pacing to be almost...normal. It's fast by Bleach standards, but it seems to be moving into long fight mode though. And plus, Kubo seems to be learning from his mistakes; Aizen's finger took up half a page(!?) but Bazz's only took up a normal sized panel. Hooray! Granted, stuff like this has happened before, but given how many good guys have been killed off lately, like Sasakibe, Yamamoto and (maybe) Kira, I wouldn't be surprised if Hitsugaya dies as well. The pacing is faster, and it's definitely an improvement when you compare it with Ichigo's fight with Ulquiorra, which lasted for around 13 chapters. Hopefully Kubo keeps up this level of pacing. Maybe, but what's the difference between Hitsugaya and Sasakibe, Yamamoto and Kira? The three are not inexplicably popular. 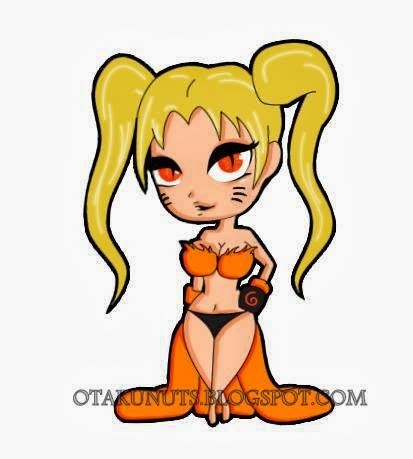 In the 6 popularity polls( http://bleach.wikia.com/wiki/Popularity_polls), Sasakibe placed 45th, and Yamamoto has never appeared in the top 50. Kira won't die. In comparison, Hitsugaya has scored 6th, 2nd, and 1st, with his Zanpakuto scoring 1st as well. I can't understand his popularity. The thing about the popularity polls is that they're conducted in Japan. Characters that are popular over there (like Hitsugaya) may not be as popular over here, and vice versa. Kenpachi and Shunsui are popular in the West, but they're not as popular in Japan. Regarding Kira, he did lose a large chunk of his torso, along with an arm, and he hasn't been mentioned after that. He could very well be dead.